It’s not often that we think about what’s going on with our back — since we’re usually the last person to see it. Couple that with the fact that plenty of women still buy into the myth that lifting too many weights can bulk you up, and it makes sense why back exercises for women still have an air of mystery around them. But seriously, guys. We know a lot more about the human body, and especially the human woman’s body, than we did even 10 years ago. We know that weightlifting isn’t just for men. Lifting weights may help you burn fat and increase your resting metabolic weight (the number of calories that your body burns at rest), along with reducing your risk of heart disease and osteoporosis. “This move is effective because it works multiple muscles at once. You can get more bang for your buck! It tones your upper back and shoulder area and even works your core — bonus!” Marks advises, “Be sure to keep you belly button drawn into your spine the entire time to engage your core. Don’t let your knees go past your toes when you squat. Slowly lower weights to start (you are still balanced on one leg) and repeat for eight repetitions. Switch legs and repeat for eight repetitions. Do two sets. 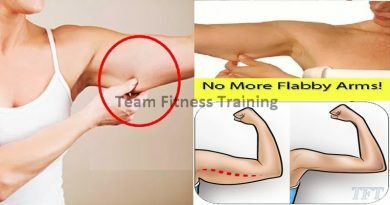 Keeping your arms straight, pull your arms to start position over your chest. As you reach start position, think about tightening your lat muscles. Do one to two sets of 15 repetitions each. Slowly lift your head and shoulders off the floor, lifting your arms, squeezing your shoulder blades together and hold for five seconds. Lower to start position and do one to two sets of 15 repetitions each. Slowly lower the weights to start position. Be sure to keep your back flat. Do one to two sets of 15 repetitions each. 6 MINUTES TO FLAT ABS – WAISTLINE SLIM AND TRIM WORKOUT!